Ethiopia has become a powerful Christian kingdom. 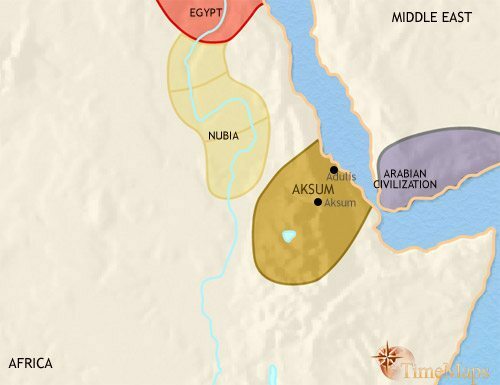 The kingdom of Axum (Aksum) has become a powerful state. It has also become a Christian state, converted by monks from the Byzantine empire. Ethiopian Christianity is centred around monasteries, which will play an enormous part in the cultural and political life of the country. Shortly after this time, the Ethiopians briefly control the south-western parts of the Arabian peninsula, before being driven back across the Red Sea by the Persians. 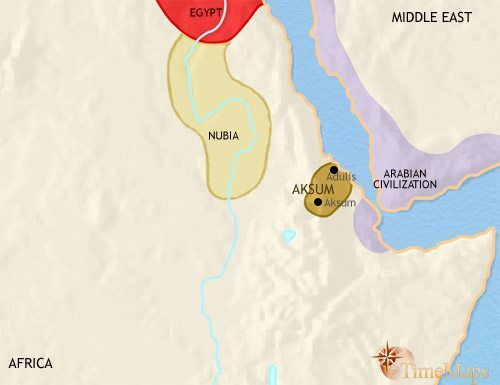 Axum, and its port Adulis, on the Red Sea coast, are flourishing centres of trade; at this time Axum apparently exercises a controlling influence upon the maritime trade coming up the Red Sea from India and the East.